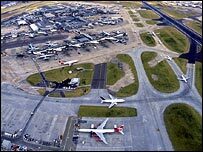 Heathrow: A "truly great planning catastrophe"
Heathrow should be replaced with a new international airport to the east of London, a planning charity claims. The Town and County Planning Association argues 30,000 homes could be built on the "catastrophically" planned west London site instead. A Thames Estuary hub would stop plane noise over London and further expansion of Heathrow displacing villages. Lord Soley, who backs a third Heathrow runway, said moving the airport would mean too many job losses for the area. He told BBC Radio 4's Today programme: "The more we move investment to the East - the Thames Estuary or wherever - the greater the problems for the west of London. "There are 70,000 jobs at Heathrow and another 100,000 dependent on it." In the planning charity's paper, Heathrow's 60-year history was condemned as "a series of minor planning disasters that together make up one of the country's truly great planning catastrophes." It also said the swap should happen over the next century. But Lord Soley said Heathrow should be looking to match the capabilities of other continental airports over the next 10 to 20 years. "You can fit a third runway in there - everybody accepts that. The argument is 'can you do it within the environmental limits laid down', and the evidence is 'yes, you can'. "If we don't, then what we have to do is plan for the decline and closure of Heathrow in the next 10 to 20 years, not 40, and that would be a catastrophe for the west London region and profoundly serious for the rest of Britain." The report also said a high-speed rail link from the new site would be an alternative to "environmentally damaging short-haul flights". The report's authors, Tony Hall and Sir Peter Hall, said passengers who fumed at the "long taxiing operations culminating in a take-off queue, or at long periods spent in the four holding areas" might well echo Dr Johnson's famous remark about a dog walking on its hind legs. "It's not that it is done well, but you are surprised to find it is done at all," wrote Dr Johnson. They also said it would be "logistically impossible" for the airport to be phased out in a short time scale of five or 10 years. A housing development at Heathrow could be worth more than £6.8bn, they said.